There is an extremely deep connection between life on Earth and the colors that we see. On the surface, this connection is very basic and well studied, but as we delve deeper, the questions become more profound and less explored or known. I will start from a simple question and keep asking why. Stay with me. The first question is, “Why do we see the colors that we see?” To answer this question on a purely physical basis, it is important to understand how the eye functions. 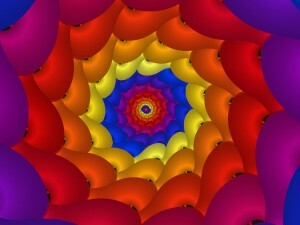 In our eyes, we have cone cells, which are sensitive to different wavelengths of light. These cone cells, named S-cones, M-cones and L-cones, are sensitized to light of wavelengths 420–440 nm (blue), 534–545 nm (green), and 564–580 nm (red), respectively. By combining the relative signals from these three types of cone cells, our brain can see a fairly continuous range of colors (10 million different colors in fact!). Thus, we see the colors that we see because these colors are just different frequencies/wavelengths of light that our eyes are specifically tuned to pick up. So now we must ask, “Well, why did our brains evolve to see those specific colors?” It is generally agreed upon that animals have evolved to see colors primarily to alert them to potential sources of food. For instance, certain birdsare sensitized to the ultraviolet spectrum which allows them to sense UV patterns found on flowers and other wildlife that are otherwise invisible to the human eye. Similarly, it is thought that the evolution of trichromatic color vision in humansoccurred as the result of our primate ancestors switching to greater daytime activity leading to a greater reliance on consuming fruits and leaves that were green, red, and orange in color. Going deeper, the next question asks, “Well, I understand that animals evolved to see certain plants, but why are these plants colored this way to begin with?” To answer this question, we must understand how pigmentation works on a chemical level. Pigments are “molecules that absorb specific wavelengths (energies) of light and reflect all others.” In order for a particular molecule to reflect a certain color, its chemical structure must be arranged in a special way. Specifically, the molecule’s electrons must be able to absorb certain wavelengths of light, but not others. Take chlorophyll for instance. Chlorophyll’s chemical structure causes it to absorb blue and red light, but hardly any green light at all, so the green gets reflected back to our eyes, which is why leaves appear green. In fact, Chlorophyll takes the energy its electrons absorb from light, and through a series of chemical steps (called photosynthesis) takes carbon dioxide and water and, using the energy from the sun, converts them into sugars and oxygen. As a result, plants get their mass from the air by turning carbon dioxide into sugars, not from the roots as is a common misconception. This process is virtually the opposite of the process discussed in my article, “When You Lose Weight, Where Does it Go? The Answer May Surprise You“. Now, why do pigments like chlorophyll absorb wavelengths of light in the visible spectrum? The answer is a Goldilocks effect of sorts. If plants had pigments that absorbed UV and x-rays, too much energy would be absorbed, causing electrons to be knocked off their orbitals, destroying the molecule. On the flip side, if plants absorbed infrared and radio waves, there would not be enough energy for electron transfer and the photosynthetic reaction could not take place. So basically, pigments absorb in the visible spectrum because these frequencies provide just the right amount of energy for powering crucial chemical reactions. At this point, lets just reflect on our journey so far before we delve even deeper. We’ve gone from asking why we see the colors we do, to why we evolved to do so, to why these colors are the colors that they are, to finally understanding why biological pigments have evolved to use these specific colors. Now, the next set of questions will force us to think about the interactions between color and the existence of life on Earth. Given that life first formed and evolved in water, how does this relate to the visible spectrum of color? 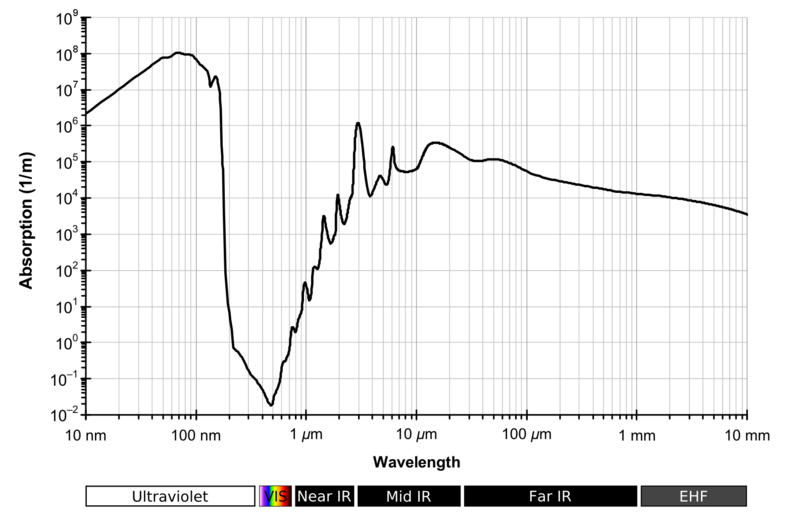 If you look at the chart above, you can see how much light is absorbed by water at different wavelengths – the higher the line on the chart goes, the more light gets absorbed and not passed through. Amazingly, water absorbs the least amount of light right in the visible spectrum, which allows more visible light to pass through, and hence why water appears transparent to us. This means that if you are an early form of photosynthetic life in the ocean or a pond, you are still able to get the light you need to survive and thrive. This is unlikely a coincidence, but merely another reason why we see the light that we do. Not only is the light we see of ideal energy for supporting life, it is also able to easily pass through water. We’re still not done. Consider this: “How does the light we see relate to the light that is emitted from the sun?” The chart above is what’s called a Blackbody Diagram. You may not realize this, but all objects radiate electromagnetic radiation according to a specific spectrum and intensity that depends solely on their temperature – even humans do! People, however, are relatively cool in temperature (98.6 F) and as a result, radiate primarily in the infrared spectrum so we can’t see it with the naked eye. Stars on the other hand, which are much hotter, tend to radiate closer to the visible spectrum, with relatively cool stars appearing red and super hot stars appearing blue. Incredibly, you’ll notice, that our star, which is categorized as a white star, is at a temperature that causes its blackbody diagram to peak right in the middle of the visible spectrum. In fact, 44% of the sun’s energy is emitted in the narrow band of electromagnetic radiation that comprises visible light. So visible light is of ideal energy for supporting life, able to easily pass through water, and also corresponds to the most light that is emitted from the sun. Wow! Given all of these connected pieces of science, I can’t help but marvel at the elegance of the universe. Putting these pieces together opens up much deeper questions, ones that I can’t even hope to answer. Can life exist on a planet orbiting a star of a vastly different temperature? If it can, will life on this planet be incredibly different and optimized to the specific frequencies of light that are most prevalent? Could life exist at all if water had a different absorption spectrum that did not bottom out in the visible range? How much leeway on these physical properties does the universe give life, and do these properties all have to overlap? Will life find a way no matter what? Are these properties specifically designed to coexist perfectly, or do we just happen to exist on a planet, orbiting a star, in a galaxy, within a universe in which all of these things are possible? Are we only capable of asking these questions because all of these things are true to begin with?